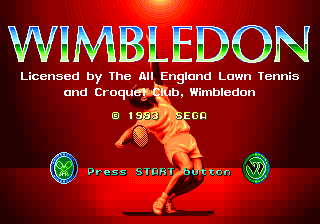 Wimbledon Championship Tennis, simply called Wimbledon (ウィンブルドン) in Japan, is a 1993 tennis game for the Sega Mega Drive by Sega. As the name suggests, the game has an official license for the Wimbledon tennis tournament from the All England Lawn Tennis and Croquet Club. It does not, however, have a license from the Association of Tennis Professionals (ATP) to use any real players on the tennis circuit at the time, so opts instead for fictional characters. Main article: Wimbledon Championship Tennis/Magazine articles.